Pemetrexed is marketed by Eli Lilly and Company under the brand name Alimta. It is the most effective chemotherapy drug for mesothelioma. Doctors often combine Alimta with platinum-based drugs such as cisplatin and carboplatin to increase its effectiveness. Alimta is approved by the U.S. Food and Drug Administration (FDA) to treat nonsquamous non-small cell lung cancer and malignant mesothelioma. Doctors have prescribed chemotherapy to treat mesothelioma for decades. Few of them have had as much of an effect as Alimta. Alimta stands out as having the most promise in prolonging mesothelioma life expectancy. It also improves quality of life by reducing breathing difficulty and chest pain. It is a medication that blocks DNA replication and cell division. This action causes mesothelioma cells to die rather than grow. When Was Alimta Approved for Mesothelioma? The first phase I study of Alimta for mesothelioma was published in 1999. It combined Alimta and cisplatin for mesothelioma and proved the effectiveness of these drugs against the cancer. In 2004, the FDA approved Alimta in combination with cisplatin for the treatment of malignant pleural mesothelioma. The approval was based on the positive results of a phase III clinical trial led by mesothelioma expert Dr. Nicholas J. Vogelzang. This study inspired other mesothelioma specialists, such as Dr. Hedy Kindler, to further study Alimta in combination with cisplatin and other mesothelioma drugs. Alimta works by stopping cancer cells from rapidly dividing. It blocks the production of folate — a vitamin involved in cell division — and stops the division and replication of mesothelioma cells. This action causes the cancer cells to die instead of grow. Alimta belongs to a class of drugs called antimetabolites. Because it blocks folate, it is considered an antifolate antimetabolite. Alimta and cisplatin are combined to improve survival. This drug combination is considered the most effective treatment for pleural mesothelioma patients who are not candidates for surgery. This is the only FDA-approved chemotherapy regimen for mesothelioma. Alimta and cisplatin are the most commonly prescribed drugs for first-line mesothelioma chemotherapy. It helps mesothelioma patients live around one year. Without it, most patients survive an average of four months. One clinical trial showed that patients taking the combination survived 13.3 months. Patients who only received cisplatin lived 10 months. Clinical trials are researching more effective drug combinations to treat mesothelioma. Alimta is used as the baseline chemotherapy drug for these combinations. One trial is testing the combination of Alimta, cisplatin and methoxyamine. The latter is a small molecule inhibitor drug that boosts the effectiveness of chemotherapy. A groundbreaking trial at The Lung Institute at Baylor College of Medicine is combining surgery with heated chemotherapy using cisplatin and Alimta. A phase II trial is combining the immunotherapy drug ONCOS-102 with Alimta and cisplatin. ONCOS-102 is designed to help the immune system attack cancer. In 2016, the National Comprehensive Cancer Network (NCCN) changed its first-line treatment recommendation for inoperable pleural mesothelioma. NCCN added the monoclonal antibody bevacizumab to the Alimta and cisplatin combination. Bevacizumab is an anti-angiogenesis drug. This kind of drug blocks mesothelioma from spreading. The Alimta and cisplatin combo has been the standard-of-care regimen for mesothelioma since 2004. The FDA might approve bevacizumab following the NCCN’s recommendation. A 2017 study published in Expert Review of Anticancer Therapy showed Alimta and cisplatin are also effective in controlling peritoneal mesothelioma. For peritoneal patients who don’t qualify for surgery, Alimta and cisplatin may be administered systemically to extend survival and reduce symptoms. The recommended dose of Alimta is 500 mg/m-2. It is administered through injection into an IV line. It only takes about 10 minutes to administer each dose. Cisplatin is typically infused over two hours. Infusion begins approximately 30 minutes after the Alimta dose. This cycle is repeated every three weeks. It is up to the mesothelioma specialist to determine how many cycles a patient receives. Alimta may be used by itself as a second-line therapy when the cancer relapses. It is also used as a maintenance treatment to prolong remission. 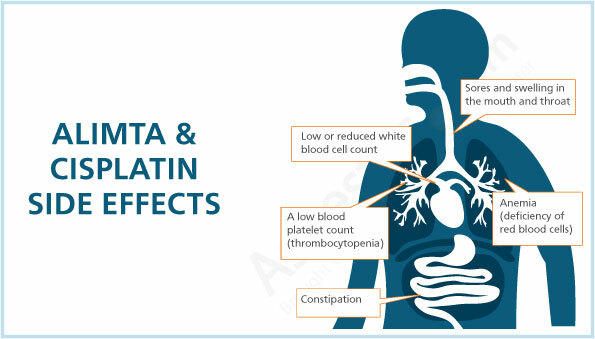 The side effects of Alimta are usually mild to moderate for most patients. Some patients may experience extreme side effects. A doctor should be informed immediately if a reaction becomes a serious problem. Mesothelioma patients should avoid being near people who have colds, the flu or other signs of illness. Be sure to contact your doctor right away if you develop signs of infection. Tell your doctor before receiving Alimta if you are taking an NSAID to avoid a drug interaction. NSAIDs include ibuprofen, naproxen, indomethacin or ketoprofen. Patients with certain conditions should consult their doctor about the risks and benefits of taking Alimta. Anyone with kidney disease, liver disease, a weak immune system or excess fluid in the space around their lungs, liver or other internal organs should take precaution. Alimta changed the landscape of mesothelioma treatment in the early 2000s. Prior to its FDA approval, mesothelioma patients had few options to extend their survival. Researchers continue to test Alimta in combination with new drugs. Their goal is to find the most effective ways to use it to improve the lives of people with mesothelioma. National Cancer Institute. (2014, September 17). Drugs Approved for Malignant Mesothelioma. Goudar, R.K. (2008). Review of pemetrexed in combination with cisplatin for the treatment of malignant pleural mesothelioma.